PTMSC Blog : Muscles needed for gathering Mussels! Chrissy (front) and Brenda (yellow pants) searching for mussels. 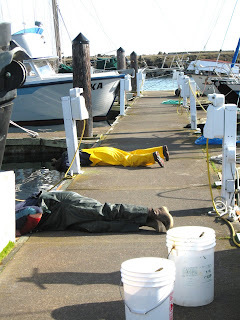 Today Chrissy, Brenda and I gathered mussels at the Port Townsend boat haven. The warm weather made it quite enjoyable...almost as fun as wearing the rubber pants! We found a variety of beautiful mussels to attach to the pilings in one of our tanks. We also gathered some giant tube worms and a variety of chitons and limpets. I hope you are as excited as I am to see the Marine Exhibit re-open this April!